Nature’s Sunshine Nervous Fatigue TCM Concentrate, Chinese contains the same herbs found in Nervous Fatigue formula but in a highly concentrated blend. Traditional Chinese Medicine would consider this a fire-enhancing formula. Its Chinese name yang xin translates to “nurture the heart.” “Weakness” in the fire element usually manifests itself in the digestive, cardiovascular or reproductive systems. 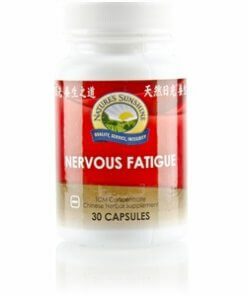 Nervous Fatigue TCM helps relieve stress and helps support digestion and promote sleep. Its key herbs include jujuba, biota and schizandra. Instructions: Take two capsules with a meal daily. Each capsule is equivalent to 4 capsules of regular Chinese Nervous Fatigue Formula combination. TCM denotes Traditional Chinese Medicine.